Are there any other uses for catnip? Have you ever seen a cat play with a toy filled with catnip? If you have, you've probably seen some really funny feline antics. 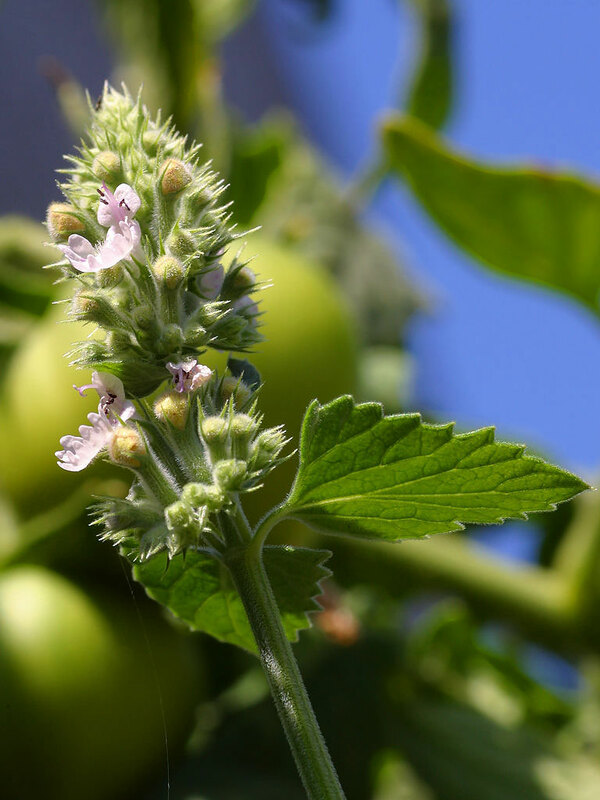 Catnip is a fragrant plant from the mint family. Its scientific name is Nepeta cataria, and it's sometimes called "catmint" or "catswort." Native to Africa, Europe and Asia, catnip can now be found all over North America, too. There are more than 250 species of catnip around the world today. Catnip grows two to three feet tall and has sturdy stems with heart-shaped leaves. The tips of the plant's stems will sprout blue, white, pink or purple flowers. Although catnip can have its effect when grown as a fresh plant, most catnip toys contain catnip that has been dried and ground into tiny pieces. The leaves and stems of the catnip plant contain an oil called "nepetalactone." When cats smell nepetalactone, it stimulates special receptors that sense chemicals called "pheromones." The result is a kind of chemical reaction that gives the cat a sense of euphoria or overwhelming happiness. The effect has been compared to that of a hallucinogenic drug on humans. When cats smell catnip, they will often paw at it, rub it, roll over it, lick it and even chew it. Cats who have particularly strong reactions to catnip may also get frisky, meow, growl, purr, drool and generally act crazy for several minutes! After a few minutes, though, the effect of the catnip wears off, and cats will ignore it. After about two hours, cats may encounter catnip again and have the same reaction. Not all cats respond this way to catnip, though. Experts estimate about 50 to 75 percent of cats are affected by catnip. Young kittens and older cats are less likely to be affected. Whether a cat reacts to catnip is believed to be hereditary, which means cats inherit this trait from their parents. For example, most Australian cats aren't affected by catnip. Catnip has been shown to affect more than just house cats. Big cats, such as lions, tigers and leopards, react similarly to house cats when exposed to catnip. Nepetalactone drives some cats crazy, but it can also drive mosquitoes, flies, cockroaches and termites away. Researchers have found that nepetalactone by itself is 10 times more effective than DEET, the ingredient in most insect repellents. Unfortunately, nepetalactone loses its repellent qualities when applied to the skin. Catnip also has a long history of use by humans as a medicine. When consumed as a tea or infusion, it has soothing and numbing effects that act like a mild sedative. Humans have also used it from time to time to treat nausea, headaches and toothaches. An old wife told me that tomorrow’s Wonder of the Day is going to be a whopper! Make sure you join us to see if she was right. Do you have a cat? What about your friends or family members? Or is there an animal shelter nearby that cares for cats? If you want to do something special for a cat, make one of the special catnip treats below. You might be surprised by how much it's appreciated! If you don't have any catnip growing wild around your house or you don't want to try to grow your own, you can find dried catnip at most pet stores! We try, snow cat! We love many different kinds of cats--pretty much any cat. Thanks for WONDERing! I submitted this question, but I don't know if it was already submitted and I just didn't see it. Hi, Brandon! You can find catnip in this Wonder! Luckily we have plenty more Wonders about cats for you to discover, trinity! Do you have a pet cat? We hope that this Wonder helps explain why, avery! i have two cats and they LOVE catnip, i did an experament with some catnip bubbles, and the results showed they liked them more than normal catnip, so if anyone wants their cats to play with them, get the catnip bubbles! We love that you created an experiment to test catnip, bluecat!! Thanks for sharing your results! Are you a cat, John? Do you like catnip?? Now I know why cats love cat nip. Cat: GIMMEE ALL DA CATNIP YOU HOOMAN ITS ALL MINE!!!!!!!!!!!!!!!!!! Yes, I am a cat from the world "Aldeltasingen". Do you dare commune with me? We dare! What's it like being a cat? I will stand up for my cat friends! Also, lots of dogs are friends with cats. They'd never eat them! wow this is obvius catnip is put in cat toys to atract them with a smell that only cats can smell. cat love this smell so they try to find what the smell is coming from. when the cat finds the toy they try to get the good smell then that leads to them (or to humans) playing with the toy. Good thoughts! You have explained a cat's reaction to catnip but we wanted to try and figure out why they care about catnip in the first place. Great one to Wonder about! 1)yes 2) yes, really we have to 3) most of the time? Thanks for WONDERing! Cool! How many cats do you own? 😳 Wow! That's a lot! Names? can my kitten have catnip? Ultimately that's up to you and your parents. Hopefully this article helped give you some more information about catnip! Thanks Allie! good thing i read this. we have catnip in my house and i always thought that my cat was having a seizer when around catnip! Thanks for sharing your connection, Glitter Girl! Go easy on that catnip! HEY! I have 4 cats and they all love catnip. What happens when you give them to much? I WONDER!!! I came to this website to ask a lot of questions!!! Why do cats have night vision? Why do cats sometimes sleep? And what kind of cat food should we be offering cats? PLEASE LET ME KNOW IM CURIOUS!!! Thank you for your WONDERFUL website!! Also why are cats afraid of cucumbers? Is that a thing, Karter? We haven't seen that before. Is your cat afraid of cucumbers? I have seen this at a zoo. And it's a mint!!!! Cool! Thanks for sharing your connection, Karter! There's enough rudeness in the world already - let's keep it friendly, Wonder Pals! Check out this Wonder: Wonder #561:Who Invented the High Five? love ur cats names F.F. Thanks for joining the conversation, jamie! Do you have any pets? My cat doesn't seem that addicted to catnip. Not all cats have the same reaction to catnip, Ivy. What makes your cat excited? is too much catnip bad for cats? my kitten runs away when i try to give her catnip. why does this happen? Lol! That's a funny story, Zoiey! Life certainly is full of surprises. Jack Frost is a great name, though! OMG I HAD A CAT NAMED Tortea and he was soooooo cuteeeeeeee!!!!!!! once he thoght he was the bigest cat in the world! he clawed at the wall and i coght it on tape! its on my framecast account!!!! If catnip is similar to a hallucinogen, will it have a negative effect on my cat's brain or other organs. Does it create lesions and things in the brain slowly over time? Thanks from a worried wonder friend. I still have a question even though this was very informative; Why does it sometimes not effect some cats? THANKS!!!!!!!!!! i love this. I didn't know any of this til' I read the article. i have catnip bubbles but there's no affect on both of my cats. one is a stray. the other is a fluffy fat cat. i have a stray but she was a kitten now she is 7 months my other cats are not strays but they are 4 years, and 3 years old we have had them since me moved into our house. My cats LOVE catnip! I didn't know a smell can cause so much happiness. I loved the video to! I learned a lot from this WONDER! Sounds like an interesting project! Have fun! My cat loves catnip at my grandma's house. Do you think it is safe for cats to have catnip? I'm afraid of what might happen if I give my cat catnip. You mentioned that it is similar to hallucinogens in humans and I don't want to drug my cat because it might hurt her or make her go crazy like the people on COPS tv show. I don't know, but thank you for your post!! I appreciate this wonder of the day, just as I have enjoyed it!!!!!!! I wonder why catnip does not effect any other animals like dogs but only cats. I always wondered why cats love catnip so much! I wonder how cats will show their feelings. Can you please answer that wonder? Thanks! Sabre to puma (I think), is the one who made me laugh the most! Keep up those wonders, and, if you haven't done this one before, why do pandas love bamboo? My cats Thunder and Lightning love catnip, and I make lots of nip toys for them. We have a baggie full of dried catnip and a live plant. Even when the catnip smell is gone from the toys they still love them. (this is probably because they actually have noses 5x better than ours and I couldn't smell it.) I like catnip smell a lot! This was a great wonder! We're so very sorry for the loss you feel for Roo-Roo, Julie. :-( It can be hard when we lose pets...they are truly a special part of our families! It helps to talk about our feelings with a grown-up when we feel sad about a pet passing away. We hope you will do that if you feel you need to! We think you have a super big heart and are a WONDERfully caring Wonder Friend. We appreciate you! This is a very weird video. I want chicken. I want liver. Meow Mix, Meow Mix, please deliver! My cat loves catnip. We bought her a solid ball of catnip, she licks it crazily! It's funny, I love my cat and she loves catnip! They probably love catnip because it makes them have a feeling and they want that feeling again and again. I have two cats and they LOVE catnip! I never knew there was catnip for big cats and that the cats like the catnip. Why don't lions like catnip is what I wonder? Wow!!! I really liked this wonder!! Probably because cats are my all time favorite animals!!!! I have 2 cats and 1 doesn't care for catnip and the other can get frisky!!! Maybe because he's younger!! I never really thought about where cat nip comes from! My cat has a cat nip shaped mouse toy. Dear Wonderopolis, Do you have anything about deserts?